We are regularly updating the website and our social media accounts with our discoveries after wading through consultation documents, and quizzing Highways England at info events and meetings. You can find out more and take part in the consultation online by visiting www.lowerthamescrossing.co.uk/haveyoursay. Email – It is so important that everyone reads the consultation documents, asks questions at info events or by email info@lowerthamescrossing.co.uk (allow 15 working days for response), and get all the answers you need to respond adequately. Please note this is not the email address to send your consultation response or comments to, that can be found below. Read and get as much info as possible. Use the free comments boxes to share all your opinions and feedback. If you need more space use extra sheets of paper (just label them with the question number they respond to) This is your chance to give your opinions and feedback. It doesn’t have to purely answer their questions, especially Question 13 ‘Other Comments’! Do NOT copy and paste info from websites etc into your response. Info on our website is to help bring you the facts we have uncovered whilst wading through the thousands of pages of consultation documents, so that you can consider your own opinions and responses. Please give personal individual responses. In 2016 13,000 consultation response were counted as 1 organised group response as they were pre-formed letters with space for personal comments. HE will do this again if they consider responses as organised group responses. 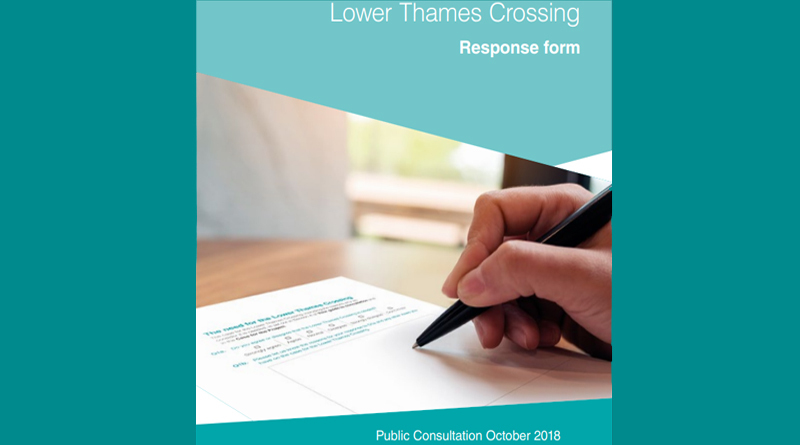 Remember that the consultation response form (paper copy and online) are asking you about the proposed Lower Thames Crossing as outlined in the consultation documents specifically, not just any new crossing. Please bear this in mind particularly when answering Question 1a. – Do you agree or disagree that the Lower Thames Crossing is needed? You need to ask yourself do you think this particular version of LTC is needed, not just a new crossing in general. Highways England DO NOT have permission yet! They do NOT have permission yet! After the consultation Highways England will analyze the responses, and then put together their Development Consent Order (DCO) application to submit to the Planning Inspectorate. If their application is accepted, you can then register as an Interested Party, to remain involved in the process. An examination period then begins that can last months if not longer. At the end of the examination the Secretary of State (Transport) decides whether to grant the DCO. Once the decision is announced there is a six week period in which the decision may be challenged in the High Court. This process of legal challenge is known as Judicial Review. You can find out more about the whole process here. On Oct 31 2018 Thurrock Council passed a motion to support the Council taking judicial review and/or legal action against Highways England with regards to the proposed Lower Thames Crossing. The South Downs National Park and Sussex resident Dr Emma Tristam were granted judicial review by the High Court with regards to Highways England’s A27 Arundel Bypass project. Highways England have not announced a new consultation, with new improved traffic modelling data, and improvements to alternative routes which were previously dismissed being bought back to the table. Highways England have paid the South Downs National Park and Dr Emma Tristam’s legal fees. Please remember that anyone can take part in the consultation, including children (with parent/guardian permission). It is not limited to one response per household, everyone can and should take part! Organisations, businesses and campaign groups can also take part, so if you have one of those you can respond on behalf of that, as well as your own personal response. Children who may not be in a position to submit a written response to the consultation can also draw a response if they prefer! Highways England have requested to help them with the analysis, it would be really helpful if an adult could include something in writing to accompany the picture, as it would help with understanding what the child wants to say about the proposals. You can take part anonymously if you wish, HE just request that your provide your postcode so they can understand where you live in relation to the scheme. Please only use the following response channels. Highways England cannot guarantee that response sent to any other address will be included in their analysis. The freepost address is the only text needed on the envelope, and no stamp is required. Paper copy response form can be collected at info events, or info/deposit locations. Remember you need to respond by one of these options, going to an HE info event and telling their team your opinions is good, but won’t be classed as a response. Section 2: What is the Lower Thames Crossing?